Structural diversity in woodlands is all about microhabitats. A microhabitat is simply an identifiably different portion of a larger discrete habitat such as a woodland. Thus, a bird nesting in a tree-hole would be occupying a different microhabitat to a millipede living in the leaf litter on the woodland floor. The more different microhabitats there are available within a woodland, the greater biodiversity will be. Different microhabitats offer differing microclimates, food opportunities, architectural structure, camouflage and sheltering opportunities. These allow a great range of organisms with very different requirements, or even only subtly different requirements, to live side by side in the same general area. The species of tree which the rotting wood was derived from. The length of time it had been rotting. Whether it was in sunshade or shade. Whether it was still standing or had fallen. Whether it was in a log pile or on its own. The type of organisms previously, or currently in residence. These might provide food opportunities, or old abandoned mines and galleries which could be used by other, later colonizers. All of these factors will subtly alter the environmental conditions present in individual pieces of rotting wood and hence also the specific species of fungi, bacteria, plants and animals to be found there. This enormous variety of rotting wood microhabitats means that in Britain, rotting wood alone may play host to over 1700 different invertebrate species, before you even begin to count the other species present. 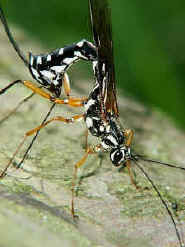 Larvae of the Sabre Wasp (left) are some of the many inhabitants of rotting wood. If we continue the scaling down process even further, hundreds of different species of fungi will inhabit rotting wood in woodlands, many of them specific to the wood of particular tree species. Those species of fungi which produce larger fruiting bodies*, provide microhabitats in their own right for over 200 species of flies, beetles and small moths. Many of these live inside the fruiting bodies in their larval stages. Each of these invertebrate species will have their own subtle requirements and some may be found only in the fruiting bodies of one particular species of fungus - a very specific microhabitat indeed! A single mature living tree within a woodland will provide another staggering range of microhabitats. These range from the leaves, flowers and fruits of the tree (different microhabitats, available at different times of year), through to the lichens and mosses growing on the bark of its trunk and branches. Different lichens will colonize different areas of the tree depending on the age of the bark, its position, how much shelter is available and how old the tree is. The lichens themselves will provide shelter and food for a variety of animals, as will the mosses and algae also growing on the tree's trunk. A variety of millipedes, woodlice and caterpillars can be found grazing on the different plants colonizing the tree's surface, all of them attracting their own predators. Viewed under a microscope, ,just one small piece of moss taken from a tree trunk, will offer up a normally completely unseen world, heaving with life. Fissures in the tree bark will harbour a range of small invertebrates, depending on how gnarled and old the bark is and hence, how deep the fissures are. 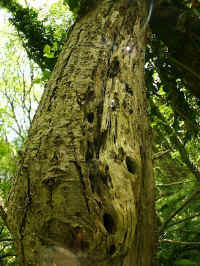 Knot holes may develop in the trunks of older trees. These will provide nesting sites for birds, such as woodpeckers and Nuthatches, as well as bats, ants and wasps. Many of these nests have their own characteristic communities of tiny animals associated with them, some of them very specific and occurring nowhere else. Depressions or holes within the main body of the tree may hold rain water, which again will contain their own characteristic communities of aquatic invertebrates. Sapflows from injuries to the tree are an important source of food for moths and butterflies. Beetles, mites and fly larvae will feed on the yeasts and other micro-organisms also capitalizing on the sap flow. The list of potential microhabitats is nearly endless! Rotting wood and a single tree are just two examples of larger microhabitats which can be endlessly scaled down into ever smaller microhabitats. The greater the structural diversity within a woodland, the more of these types of microhabitats there will be available. Structural diversity is enhanced through having a variety of different tree species, of differing ages, making up the woodland. Natural environmental variations within the woodland, such as areas of differing soil type (for example, acidic, or lime) and degree of water saturation, will provide conditions suitable for the growth of a wide range of different types of plants. Glades and rides within the wood, provide areas suitable for less shade-tolerant plants. All of the variety of plants within a wood will offer different microhabitats and food opportunities for an enormous number of other organisms. The decaying products of all these plants, from leaf litter to rotting wood, provide food sources and microhabitats for thousands of other different kinds of organisms. 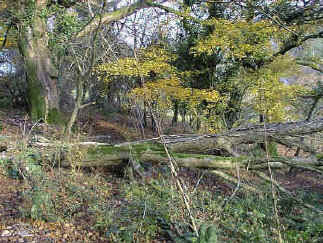 Large individual rotting logs, piles of logs and old tree stumps provide a staggering number of microhabitats, as will old trees. If these are left to die naturally in the woodland, rather than being harvested at an appropriate time, they will acquire a value for wildlife which is usually proportionate to their age.